I recently got the Best of Pixar cartridge and was dying to see what I could make. If you have me on faceboook you saw the cut of Mr. Incredible the other day. Today I am posting the finished product! I made a giftbag and card set *okie thinks she really needs to stop pointing out the obvious*. The card is very simple. 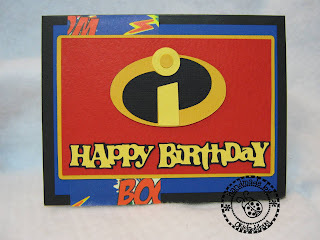 I thought the theme of the card needed to be the focal point and I know what you are thinking "OMG OKIE DIDN'T INK! I GOTTA GRAB MY CALENDAR". But just calm down for a minute and I will tell ya why I didn't. Since the theme is based on a cartoon and is likely more masculine I thought I would forgo the ink and just let the theme be incredible *okie elbows her readers in their sides and laughs* GET IT?? Huh? Do ya?? *okie slaps her knee laughing and notices no one else is laughing...clears her throat and continues*. Since I had happy birthday on the front I didn't print it for the sentiment on the inside. The bag front measures 8" wide by 10.5" tall so it is a decent size giftbag. I only decorated the front of the bag *okie knows it is because she is too cheap to waste paper decorating the whole thing but won't share that thought* and I think that was enough because that is what people pay attention to the most anyway. I didn't want to overdecorate because I didn't want the image of Mr. Incredible to get lost in a bunch of patterns. The "burst" is also on the Best of Pixar cartridge and I thought it added a nice touch. Oh the patterned paper is a something I only had one sheet of so I had to make it count. My friend Linda, aka LGuild, gave it to me quite sometime ago saying it was "ugly paper, just see what you can do with that!". She can be so hateful sometimes!! Too cute. 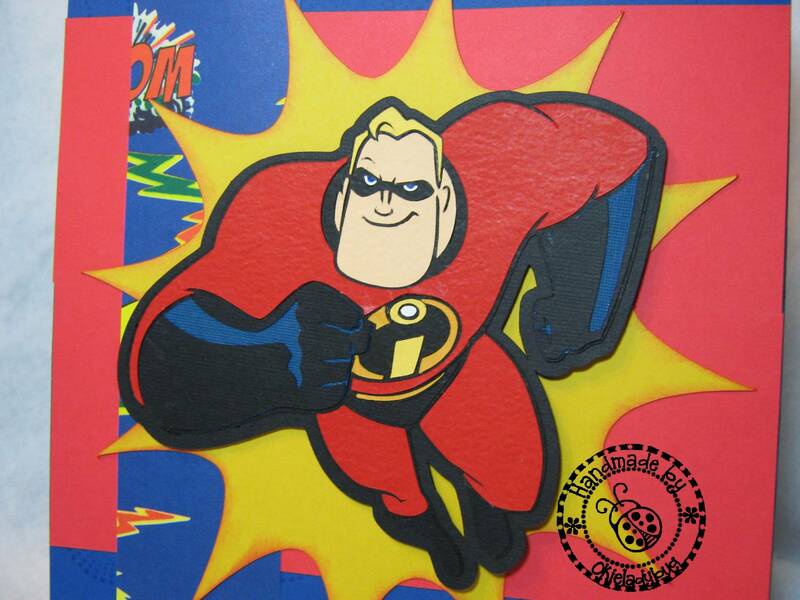 We love the Incredibles this way. Love your card and bag. TFS and for the laugh, I got it! Incredible gift set Okie!! You know you are going to hear that all day!!! Adorable!!!!! I love it!! I just received this cart and havent even tried it yet!!! This is the ONLY thing I can ever see that ugly paper being used on! lol! It does look great with the superhero character. If you need more sheets of it, ask the teacher I donated all the paper to, I think she got the rest of the sheets I had. 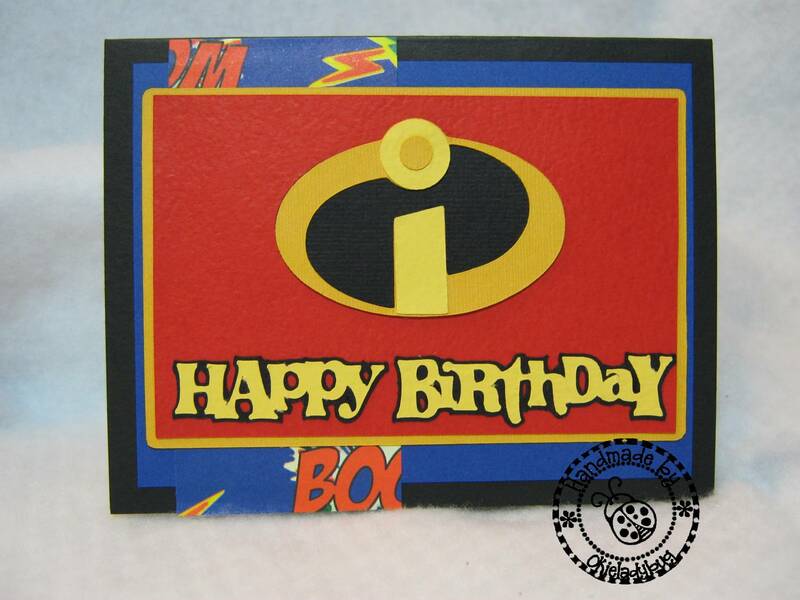 This is a perfect set to use for a birthday boy...even if he's fully grown! The "Ugly Paper" looks great on this project. Wonderful job! LOL.. I can't stop laughing!!! You crack me up!!! Your card and bag are AWESOME!!! You always do such GREAT work, but you don't need me to tell you this. Thanks for MORE inspiration!!! That's so wonderful, Okie!! I love the gift set. Adorable! LOVE LOVE LOVE LOVE LOVE!!!! Awesome job! See, it wouldn't even matter what was in the gift bag because the card and packaging are just so cute. This would be great for little kids or the adult kids who still love cartoon hero's. Oh, dear. Did you see the new HELLO THURSDAY Cricut carts? VEEERRRYYY cute. You better not say mean things about Linda or she might just keep her paper next time missy! Cute card & bad! What can I say - INCREDIBLE! Now you've made me want another cartridge! Mr Incredible is really incredible. I love your creation today.I'll bet Linda is eating her words. I just became a new follower..Would love it if you decided to follow my blog. Wow! can't believe I missed your awesome giveaway..story of my life always running late..even when I try to be early.. 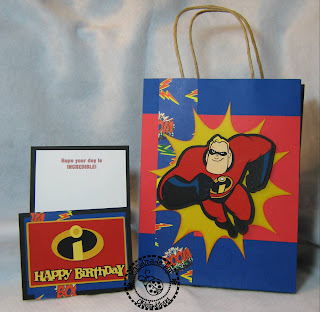 I recived some of this Ugly paper in a paper swap a long time ago and used some of it for a non traditional Halloween LO for my son who was dressed like superman! I love the LO and the paper works perfectly! LOL... just like on your incediable card and bag! ;D keep up the great work.